Anna explained how she and two friends - Maxine March and Jackie Maxwell - all experienced quilters and members of The Quilters' Guild, decided to develop their mutual interest in Canadian Red Cross quilts into a research project. The Red Cross quilts currently on exhibition as part of this year's Quilt Association summer show were brought together by the group. 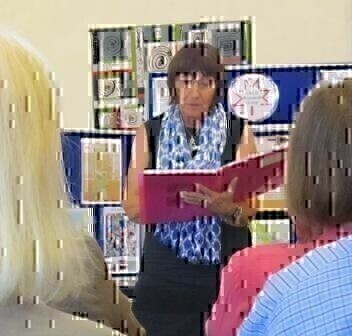 Excitingly, for this talk, Anna brought with her yet more Red Cross quilts to show everyone, and told some of the stories of the quilts that she had been lucky to study. 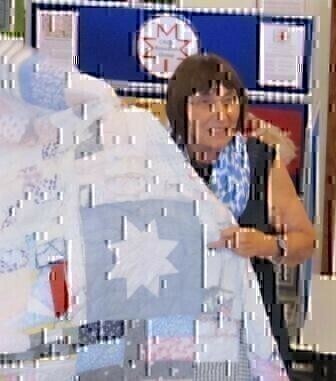 Anna was working in a charity shop when she first came across donated quilts with the Red Cross label. She started to look into the history of the quilts, and soon realised that they had been made in Canada by women during the Second World War, to be sent to people in Great Britain who had suffered hardship as a result of the bombing. Many thousands of quilts were sent, including 25,000 from the Nova Scotia region of Canada alone, but there are just 20 in our exhibition at The Minerva Arts Centre. The question remains - where have all the rest gone? 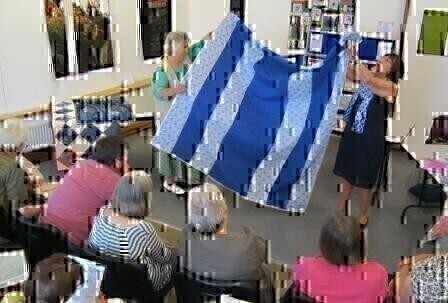 Some of the quilts were Victorian in origin - no doubt removed from linen cupboards and sent on. Others were new, made in sewing centres which were set up around Canada. 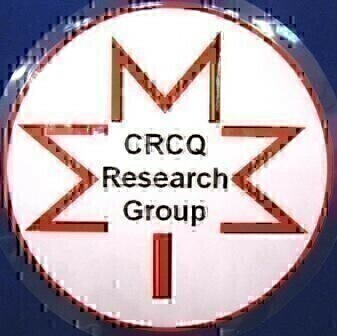 The Red Cross provided the wadding and backing material, and the Canadian quilters made the quilt tops, often using basic fabrics such as pyjama material. Many reflect the "make do and mend ethos" of the era, when every scrap of material was used. 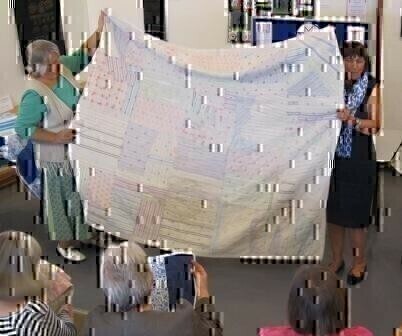 Anna told the story of one quilter with 18 children who walked 2 miles every week so that she could sew. It was a social occasion, where women would sew and chat. Some of the groups are still thriving today, including the Imperial Order of the Daughters of the Empire. People made homeless by the bombing. Those who were forced to relocate to other areas to make room for training troops. Canadian Armed Forces in London. Anna told the story of a woman who had been bombed out of her own home and then found an empty house to move to. It was cold, she only had summer clothes to wear, there were no carpets and just black-out curtains. She described how strange it was to sleep in a bed again, after months in a Morrison shelter. She received three quilts from the Red Cross. A boy who was evacuated from his home near London was given a patchwork blanket at King's Cross railway station just before travelling to Macclesfield to stay with another family for the remainder of the war. Anna related many other stories from her growing collection - people who visit the exhibitions such as our summer show often have stories of their own to tell. If you have one - please get in touch! To rescue as many Red Cross quilts as they can and form a joint collection. 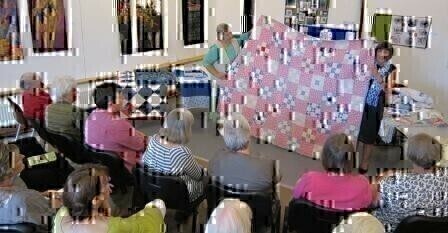 To raise the profile of these quilts in both the quilting world and with the general public by giving talks to interested groups and finding exhibition space for the collection. To collect stories of the makers and the recipients.